﻿ News Bharati - 'India Size'.. one of its kind in Indian history..! News Bharati - 'India Size'.. one of its kind in Indian history..! 'India Size'.. one of its kind in Indian history..! Mumbai, February 7: “India Size is an emblem and a resolve between the industry and the government, which will benefit both consumers and manufacturers. The never done before anthropometric study will lead to a size chart that will mainly benefit our consumers, besides the industry”, said Textile Minister Smriti Irani while addressing the masses at the launch of India Size project on Wednesday in Mumbai. A first-of-its-kind project in the history of India, India Size aims to arrive at a standard Indian Size for the ready-to-wear clothing industry, on the lines of the standardized sizes available in countries such as the USA and the UK. A size chart that is specific to Indian consumers' measurements will be developed. This will help Indian apparel manufacturers to tailor their cuts closer to the actual body measurements of consumers, she added. Meanwhile Irani assured that the government is committed to ensuring that those who seek to train people in stitching, tailoring, apparel making and in retail will come together under schemes of the Ministry and start upon a new journey in skilling segment. This move of the government is also to benefit consumers, manufacturers and the industry as a whole. The project is being undertaken by the Ministry of Textiles, in collaboration with the Clothing Manufacturers Association of India (CMAI). “Many are yet to realize the potential of the Indian retail sector. Many leading brands have come together and expressed their desire to partner directly with India's weavers”, she added. Irani also inaugurated a study of Apparel Consumption in India. 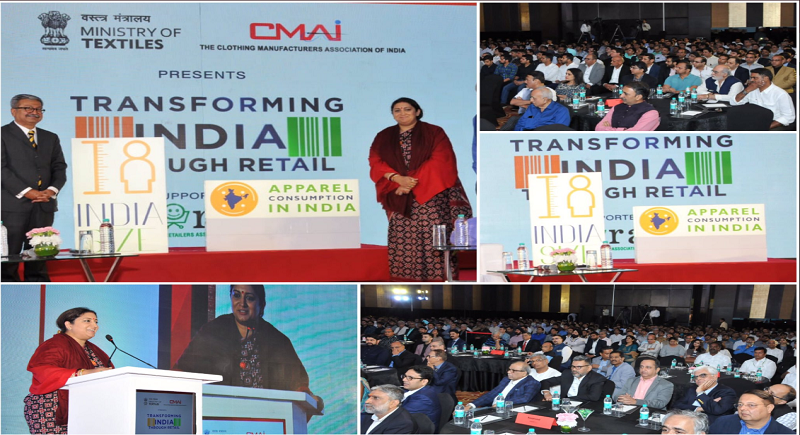 “Representing over 45,000 apparel manufacturers and retailers, Clothing Manufacturers Association of India will be conducting a study spread across three to six months, for arriving at an accurate assessment of the total apparel consumption in the country, thereby resulting in more accurate business projections, better marketing strategies and investment into the industry”, reported the statement. The Indian Size will put the country on par with developed countries, which typically follow a standardized size for their consumers such as the US Size, UK Size, Mexican Size. The Indian Size will provide tremendous benefit to the consumer by offering standardized sizes, better-fitting clothes, reduced hassles of purchase returns and reduction of wasteful expenditure due to incorrect purchases. It will benefit the manufacturer by enabling minimization of wrong inventory and expenses on returned goods and improving sales. All these factors will contribute towards reduction in ultimate prices paid by the consumer. With higher sales, increased consumption and lower expenses, investments will also go up in the industry. With increasing spread of the Indian diaspora across the world, an Indian Size is also set to increase exports from India.